Rabbi and theologian; born in Fürth, Bavaria, May 10, 1843; a descendant of a family of rabbis. He received his rabbinical training at Hassfurt, Höchberg near Würzburg, Mayence, Altona, and at Frankfort-on-the-Main (under Samson Raphael Hirsch), and his university training at Munich, Berlin, Leipsic, and Erlangen (Ph.D. 1868; his thesis, "Der Segen Jacob's," was one of the earliest Jewish essays in the field of the higher Biblical criticism, and its radical character had the effect of closing to him the Jewish pulpit in Germany). Abraham Geiger, to whose "Zeitschrift" Kohler became a contributor at an early age, strongly influenced his career and directed his steps to America. In 1869 he accepted a call to the pulpit of the Beth-El congregation in Detroit; in 1871 he became rabbi of the Sinai congregation in Chicago. In 1879 he succeeded his father-in-law, David Einhorn, as rabbi of Temple Beth-El, New York city; his brother-in-law, Emil G. Hirsch, becoming his successor in Chicago. Feb. 26, 1903, he was elected to the presidency of Hebrew Union College, Cincinnati. From the time of his arrival in America, Kohler actively espoused the cause of Reform Judaism; he was one of the youngest members of the Philadelphia Jewish Rabbinical Conference of 1869, and in 1885 he convened the Pittsburg Rabbinical Conference, which adopted the so-called "Pittsburg Platform," on which Reform Judaism in America stands. While in Chicago he introduced Sunday lectures as supplementary to the regular Sabbath service. Kohler served for many years as president of the New York Board of Ministers, and is at present honorary president of the Central Conference of American Rabbis. He was editor-in-chief of the "Sabbath Visitor," a Jewish weekly for the young, from 1881 to 1882, and of "The Jewish Reformer," a weekly devoted to the interests of Reform Judaism, in 1886. He has for a number of years been deeply interested in the "Jewish Chautauqua" movement. Shortly before his departure from New York in 1903 he delivered a series of six lectures at the Jewish Theological Seminary on "Apocryphal Literature." 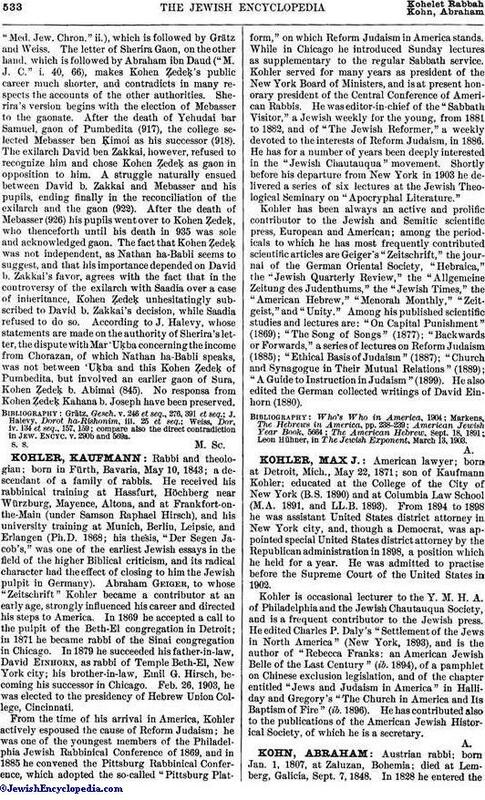 Kohler has been always an active and prolific contributor to the Jewish and Semitic scientific press, European and American; among the periodicals to which he has most frequently contributed scientific articles are Geiger's "Zeitschrift," the journal of the German Oriental Society, "Hebraica," the "Jewish Quarterly Review," the "Allgemeine Zeitung des Judenthums," the "Jewish Times," the "American Hebrew," "Menorah Monthly," "Zeitgeist," and "Unity." Among his published scientific studies and lectures are: "On Capital Punishment" (1869); "The Song of Songs" (1877); "Backwards or Forwards," a series of lectures on Reform Judaism (1885); "Ethical Basis of Judaism" (1887); "Church and Synagogue in Their Mutual Relations" (1889); "A Guide to Instruction in Judaism" (1899). He also edited the German collected writings of David Einhorn (1880). Leon Hühner, in The Jewish Exponent, March 13, 1903.